BLADE OF THE SAMURAI: June, 1565: The shogun summons master ninja Hiro Hattori and Portuguese Jesuit Father Mateo and orders them to find his cousin’s killer. Initial evidence implicates Hiro’s friend and fellow shinobi, Kazu, but Hiro soon learns that the victim’s wife, a suspicious maid, and even the shogun’s stable master also had reasons to want the victim dead. 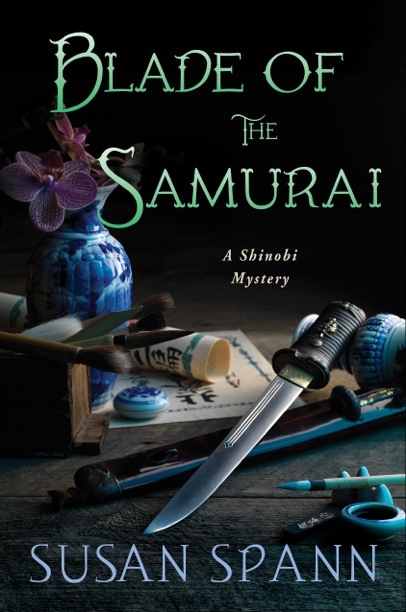 The investigation reveals a plot to assassinate the shogun and depose the ruling Ashikaga clan. With enemy forces approaching Kyoto, and the murderer poised to strike again, Hiro and Father Mateo must produce the killer in time . . . or die in his place. Susan is giving away a copy of Blade of the Samurai! See details below. 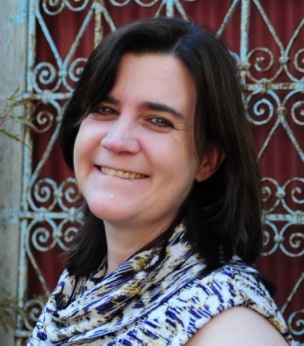 Welcome, Susan, and thanks for answering our questions! A writer. I wrote my first full-length manuscript (longhand…) at the age of 15, and edited it through my high school years. The inspiration was a short-story assignment in my ninth-grade English class, which I turned into a fantasy novel about an orphaned girl with no magical power who grows up in a world where magic is banned (and mages are executed on sight), and learns that she is her world’s only hope for salvation. In other words: Generic Fantasy Novel 001. That novel is now mercifully locked away in the Universe’s Strongest Trunk—but the dream of being a writer is (equally mercifully) alive and well. In addition to The Fantasy Which Shall Not Be Named, I wrote four full-length historical fiction manuscripts before I wrote my first mystery, Claws of the Cat (Minotaur Books, 2013). I learned a lot from those manuscripts, including the all-important “how to write well enough for publication.” I queried them all (yes, including the fantasy…and I have the hand-typed rejection letters to prove it), but something was missing and I didn’t land an agent. In 2011, I realized that the missing element was the assassination of imaginary friends. Once I jumped the genre fence and found my niche in mystery, things clicked right away. I signed with my first-choice agent, and she sold the series in less than 90 days. One thing I’m quick to tell writers: keep writing, and listen to any story that buries itself in your heart and demands to be told. It may take a while to reach success, but you’ll get there if you don’t give up. Yes, but I’m afraid to tell you what they are. The third Shinobi Mystery, Flask of the Drunken Master, is in production at Minotaur Books and scheduled for publication in July 2015. I’m currently working on Book 4, working title Blood of the Outcast, in which Hiro and Father Mateo must solve the mysterious murder of an actor’s daughter. My college-age son, Christopher, has been my alpha reader (and strongest, most outspoken critic) since 2011, when I wrote Claws of the Cat. He’s the only person who knows the Shinobi Mysteries as well as I do, and the only one (aside from me) who knows where the series is headed. After I outline each book in the series, I take him to dinner to talk through the plot. He’s great at spotting holes and inconsistencies, and the books are stronger for those early talks. When I reach draft 5 (the first four drafts are for my eyes alone) I give him the manuscript to read. His feedback is accurate, honest, and irreplaceable. When you were a teenager, what did you think you’d be when you grew up? Did you end up changing paths? GIVEAWAY! Comment on this post by noon EST on Friday, July 25th, to enter the giveaway for a signed copy of BLADE OF THE SAMURAI. US and Canada only. Follow The Debutante Ball on Facebook and Twitter for extra entries—just mention that you did so in your comments. We’ll choose and contact the winner on Friday. Good luck! Susan Spann writes the Shinobi Mysteries, featuring ninja detective Hiro Hattori and his Portuguese Jesuit sidekick, Father Mateo. Her debut novel, CLAWS OF THE CAT (Minotaur Books, 2013), was named a Library Journal Mystery Debut of the Month. The second Shinobi Mystery, BLADE OF THE SAMURAI, released on July 15, 2014. Susan is also a transactional attorney whose practice focuses on publishing law and business. When not writing or practicing law, she raises seahorses and rare corals in her marine aquarium. You can find her online at her website (http://www.SusanSpann.com), on Facebook (https://www.facebook.com/pages/Susan-Spann/303155186458624) and on Twitter (@SusanSpann). I love historical mysteries, and it’s always fun to learn about other cultures—thanks for the opportunity to win a copy of this book! I follow The Debutante Ball on Twitter (skkorman)! As usual you make me laugh, Ms. Spann. I never knew you wrote a fantasy! FANTASY?! Glad you found the dark side. Thanks for posting with us! The history of Japan in a mystery book is a really unique thing these days. Looking forward to getting into this series. I love that you have such a great relationship with your son such that you all can work together with obvious good communications. I have a grandson who talks and listens to his grandma and whose judgement and communication skills serve to help us both in life. Would love to win this book . I admire your persistence and perseverance, Susan. So glad you made it through to Shinobi mysteries! This novel sounds memorable and unique. Combining Japan which in itself is intriguing and mystery is a powerful mix. Your talent and creativity is wonderful to learn about. When I was a teenager life was completely different from today since we were not yet immersed within the adult world and were innocent. Girls at that time pursued careers such as teachers or nurses. I contemplated a future which was foggy and couldn’t realize what was in store for me. Wishing you much happiness and great success.